EnCore Plus® ultra-high density eliminates the air pockets you see in other coreboards. Because of the ultra-high density of EnCore Plus,® these products are harder and denser–more difficult to penetrate resulting in better overall performance and stability. It’s true. EnCore Plus® floors are harder, denser, more dimensionally stable, and tougher—all attributes of a floor that is more forgiving. A more forgiving floor is easier to live on. 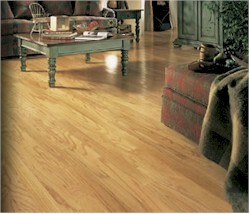 Anderson gives you permission to live on your EnCore Plus® hardwood floors.